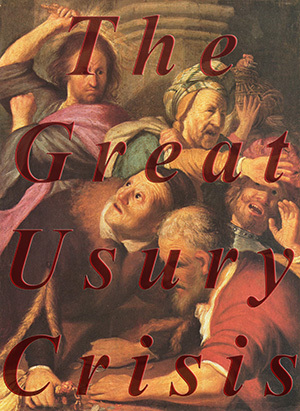 A collection of posts discussing the nature of usury, and its role in the current recession. The image is Rembrandt's Christ Drives Money-Changers from the Temple, 1626. Money can only "serve" us under the law when it is sound, all else is "corrupt" as it was in times past where folks lost trust to such an extent that they felt obliged to leave their savings in the safe-keeping of temple employees, who of course couldn't resist the temptation to use the talents entrusted to them for their own purposes, usurping the purposes of the true owner of the property - what a metaphor for fallen humanity, we usurp our faculties from their God-owned purposes, indeed anyone who fails to thank the Lord for all he has commits usury! The usurpation underlying the crisis we now face was the pretended "products" -- which were created, marketed and sold, and ended by trading in circular patterns of increasing opacity. The usurpation was the conceit of these engineered concoctions that they were as firm and real as something like a piece of land. The "something that doesn't exist" was when, say, a new security was confected out of the short positions of people operating in the CDS market. The underlying asset here may have been a piece of land and an overvalued house, but no new asset was created by the short bets in the derivative market. Procuring a revenue stream from a derivative does not mean you have conjured a new asset. It may also have been usury (I'm not totally convinced on this) to allow people to write and purchase CDS contracts regardless of whether they held the underlying bond. To me, permitting this practice is like opening a back-door to the naked short-sell, but possibly I am missing something. OK, if its usury to write a contract based on property rights not in your possession, why are we permitted to avert risk using insurance? The folks in the 9th Ward in New Orleans didn't own the levies that failed, but they could still buy flood insurance to protect themselves when they did. Deo Gratias, otherwise they'd have been wiped out, right? The fault lies with the valuation of the asset not the material (or immaterial) nature (seen or unseen) of the asset. Rather than physics per se, its more a question of the metaphysics of price discovery and property rights, tangible assets vs intangibles, fungibles (mutuum contracts) vs real assets (commodatum contracts). To bank real assets you keep them in a safety deposit box. To bank fungible assets (wheat, oil, money) you deposit them in a facility designed to preserve their value, an airdried hopper for corn away from moisture that could encourage rot to set in the material, an underground tank for oil away from heat sources that could incinerate the material, and for currency in an irregular deposit with your favorite financial institution. The "thing that does not exist" to use your terminology, is the property right. The person charged with safekeeping has not had the property rights transfered and therefore may NOT make use of the asset without the owners permission for example to loan some grain to a friend whose crop has failed early but doesn't want to miss sowing season. For if he does so without a reserve to back himself up when the owner comes calling (for his own portion to sow) the safekeeper will be found "short," he is bankrupt and he has ill gotten gains - the fee he collected for doing his friend a favor rightly understood belong to the owner of the goods being lent out, not the safekeeper, for it is his goods being risked in the transaction, the safekeeper has "no skin in the game" to use a colloguialism. The 'credit default swap' may sound modern but to use our primitive example, the baker could purchase insurance on the granary's contents even if he owns none of the contents, he simply wants to provide a safety net for his business (and the employees he desires to retain thru hard times) in the case that a wet winter leads to rot afflicting the supply of wheat that the miller can get his hands on to mill into flour. The price of flour being dependant on supply and demand, the miller need not insure himself - he'll be able to raise his prices and sell a smaller quantity at a higher price and not lose out himself. Do you see the chain of events? The problem with the bubble (or the water that flows uphill) is that the banks use our deposits for their private gain. And when they find themselves "short" the Fed as lender of last resort creates new money out of thin air, so to use Thomas Aquinas analogy of the wine in a wine bottle, they've lent out five glassfuls that they didn't own, and when the wine evaporates or is spilt because the borrower was incapable of its safekeeping, the Fed fills the bottle up with water and returns it to you, making you "whole." ANYONE WHO BELIEVE'S IN THIS FAIRY TALE IS NOT MATURE ENOUGH TO BE HANDLING MONEY! They're destroying the value of our money right before our eyes, its quite an old trick "on the adulteration of monies" I believe was written over 500 years ago. for some up-to-date links from a Roman Catholic American in Korea.